6mm teardrops (6mm from end to end, about 4mm wide) with the hole running sideways through the narrow end. 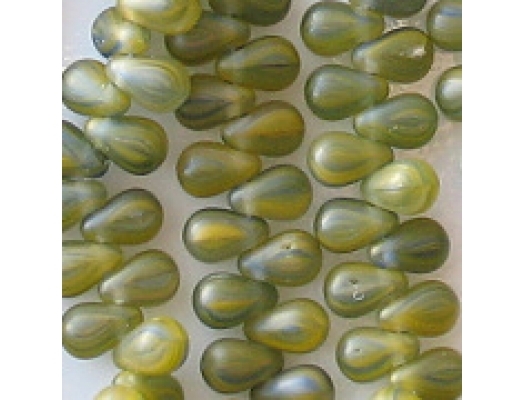 A mixture of clear, opaque blue, opaque yellow and opaque green glass. I believe, though I'm not sure, that the green results in those areas where the yellow and blue combine. 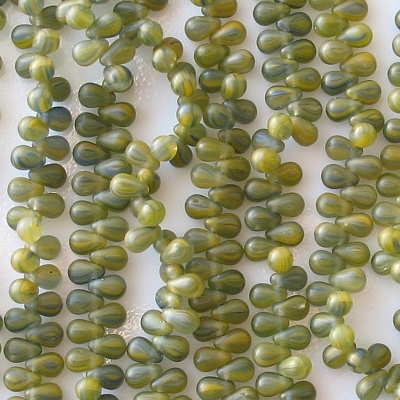 Multicolored beads often have minor problems, as these do. I would say that up to 20% of them have small pits or, less commonly, fissures. The defects are hard to see, and I think that most of those beads will end up being used, so I haven't reduced the price. The price is already fairly low. 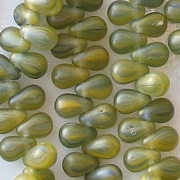 These are pretty beads. In low light they look darker than the picture indicates.